European Commission: Commission to open Global Earth observation data. US: This Week at Interior, Nov 20, 2015, Secretary Sally Jewell. EUMETSAT: EUMETSAT renews commitment to GEO. Future Earth: Future Earth partners with GEO to address global challenges. RDA: Research Data Alliance joins Group on Earth Observations as participating organization. Secure World Foundation: SWF Contributes to GEO-XII Plenary & Mexico City Ministerial Summit, Highlights Spectrum Management Issues. WMO: Meteoworld - The Power of Shared Earth Observations. Free Data from USGS Proves Its Worth for Observing Earth. 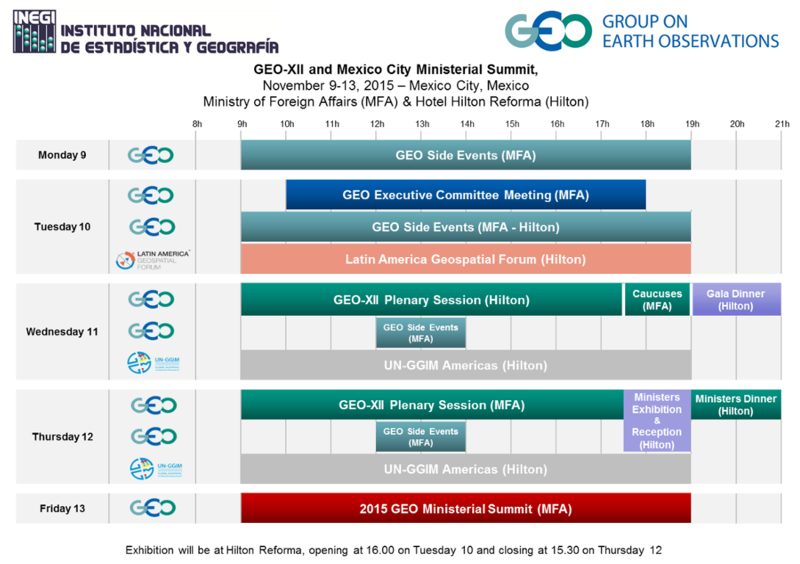 South Africa: Minister Naledi Pandor – Group On Earth Observations Fourth Ministerial Summit. ESSC statement on climate change, European Space Sciences Committee (ESSC). Butterfly monitoring: an important biodiversity loss indicator made easier to measure. DOI Secretary makes remarks at international climate talks (Native Times). Researchers Model Near Future of Coastal Redwoods’ Habitat (University of California, Merced). Challenges in Environmental Technologies Development and Climate Change (Georgia Today). US, Mexico sign deal on sharing satellite data directly (NASA). GEO Commits to unleash to power of open data to address global challenges (GIS Café). Making a case for open data, P7 OpEd, Geospatial World, December 2015 by Prof Arup Dasgupta. The press coverage in Spanish language, Mexico 8 to 16 November, 2015 totaled almost 10 million impressions.